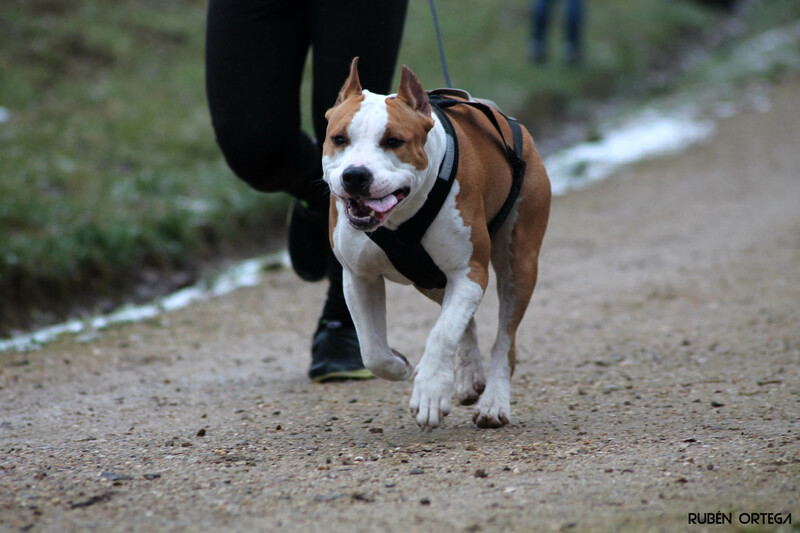 I wanted to give an update on my canicross and bikejoring cross-training journey with Knoxx! If you’re not familiar with these dryland mushing sports, be sure to check out my blog, “Fitness for You AND Your Dog.” In my last blog posting, “Knoxx’s Introduction to Canicross,” I also describe how I started my canicross training with Knoxx. Some of the reasons I decided to participate in these sports is because I wanted to 1) increase Knoxx’s overall cardiovascular fitness level, 2) integrate more cross-training into our exercise routine to help Knoxx achieve peak performance, and 3) to maximize our time together so that both of us could get a workout at the same time. I’ve made adjustments to our training schedule over the past month so that I could see more improvement in our running capacity. Instead of cross-training throughout the week with two days of canicross, I’ve now bumped our canicross days to three times per week. I’ve seen improvement with this change, and even my boxing coach told me last week that he noticed my own fitness level was improving. I strongly believe that I owe this to my canicross training days! Set realistic goals. This is huge when it comes to staying motivated! The other day Knoxx and I had a HORRIBLE run. We had to keep taking walking breaks. I had to remind myself that the temperature was 30 degrees warmer than when we normally train. Instead of feeling disappointed in our run, I used this as a reminder of how much temperature and humidity can impact training. Set weekly measurable goals for you and your dog. Things that you can measure might include days per week training, distance traveled, time spent exercising, number of repetitions, and more. Find a way to document your progress so that you can note improvements when they occur or use data to confirm when your program is not working. I am keeping track of how far I run with Knoxx and how long it takes me to complete my runs. (I also make note of intensity.) Analyzing this data is what made me realize I needed to make adjustments to our program. Stay committed. It WILL pay off in the long run! Improving fitness doesn’t occur overnight! On the days that I don’t feel motivated to train, I have to remind myself why I am doing this. I have to stay true to my commitment or else all the hard work that we did over the last few weeks will be totally wasted if I start to get lazy now. Frequently remind yourself of your vision and goals to help you stay motivated. It’s easy to get wrapped up into the “here and now.” It’s easy to say, “I’ll do it tomorrow.” By reminding yourself why you are doing this and why it’s important to you is a necessary component to staying committed and motivated. Find a supportive community. Going solo can be hard! Often our motivation is high when we start something new, but as the novelty wears off, we need ways to stay inspired. Having an “accountability partner” to share training plans, following a Facebook group that participates in the same activities as you, hearing other people’s successes and sharing your own progress are all ways to keep learning, stay inspired, and guarantee success. So are you ready to strive for peak performance for your dog? Do you have a vision? Have you set your goals for the upcoming week? Are you documenting your progress? If not, there’s no time like the present to get started! Set those fitness goals and keep me posted on how you’re doing!